The forecast in Australia: Hot, hot, hot—and getting hotter. months now), the continent’s Bureau of Meteorology has added two new colors to the weather map to reflect the rising mercury. degrees Celsius. But forecasts are predicting off-the-charts weather. Celsius—should it climb that high. in excess of 50 degrees celsius," said David Jones, head of the bureau's climate monitoring and prediction unit. degrees Celsius (102 Fahrenheit). The trend seems likely to continue. Adding to the misery, the searing heat is also fueling wildfires that continue to rage in southeastern Australia. South Wales Rural Fire Service commissioner, told the Associated Press. 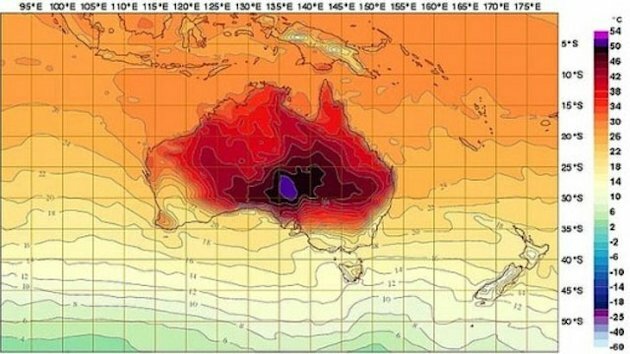 Australia isn’t the only place battling record high temperatures. Last year, the United States had its warmest year on record.